The complete title is important: Apples of Uncommon Character: Heirlooms, Modern Classics, and Little-Known Wonders . Rowan Jacobsen is a journalist, one who has received James Beard Awards for a book ( A Geography of Oysters and for his essays. He’s also the author of American Terroir . 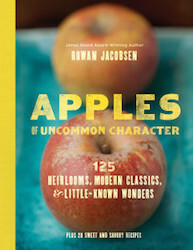 I first read his work in a Southern Living piece about the lost apples of the south, and that led me to Rowan Jacobsen’s Apples of Uncommon Character: Heirlooms, Modern Classics, and Little-Known Wonders . Jacobsen’s story begins when he and his spouse purchased an old house on four acres in rural Calais, Vermont. He soon discovered that old houses, and old roads and pastures in New England are usually close associates with old apple trees, many of them of almost lost heirloom varieties, and some, local cultured varieties carefully cultivated by Yankee apple fans. Jacobsen’s book is a chronicle of those almost lost heirloom varieties as well as more recent cultivars. These are apple varieties were often best eaten as near to the tree as possible, unlike the ubiquitous Red Delicious, bred mostly for its color and ability to be shipped across the country (and the world). American apple growing in the 18th and 19th centuries meant a plethora of different varieties for different growing areas, seasons, and purposes, from eating on the spot, to cooking in pies, canning as fruit or apple sauce or apple butter, and, of course, the very specific needs of cider production. Many of these older varieties have flavors we don’t today usually associate with apples, ranging from cinnamon or clove notes, to the wine-like qualities of the Winesap, to those that were sour when picked, but when properly aged in a dry cellar for a few months made incredible cider (and later, cider vinegar). Some of this variety is directly due to human crosses (or more likely, grafts). Apples left alone or grown from seeds are a lottery; the maternal genetics of the tree that bears the fruit may be known, but the pollen that fertilized that particular blossom could be from any number of apple trees. Generally speaking, the apples we grow on purpose are grafts, a shoot from a particular tree grafted on to root stock. Apple trees grown from seed really are a lottery, so from the early popularization of apples in Europe by the Romans, until the modern Honeycrisp and Fuji, apples are usually propagated by grafting. After some introductory sections on the history of apple cultivation and culinary evolution, most of Jacobsen’s book is a series of apple portraits; a photograph (these are stunning images), a description of the apple’s flavor and virtues and a short history of the apple’s cultivation. These portraits are divided into sections based on the best uses of the apples; summer growing, baking and apple sauce, keepers (apples that store well over a winter), cider apples, and, finally, those he terms “oddballs,” with oddities of shape and appearance. The portraits are followed by apple recipes. These are clearly written recipes that use apples in just about every imaginable course; I can endorse the pork carnitas with green apple salsa. The recipes often suggest a specific kind of apple to use, but these are suggestions only. There’s a dedicated section on the perfect apple pie, which I have to say, is one of the most useful how-tos for making an apple pie I’ve ever read. After the body of the book proper, there’s a useful glossary of apple terms, resources (including websites) for apples and apple trees and cider by mail, a list of apple fairs and festivals, an index of all the apple varieties in the book, and a recipe index. This is a fantastic book. It’s a pleasure to read, but it’s packed with useful easy to find information. Rowan Jacobsen has a website, and he’s active on Twitter.